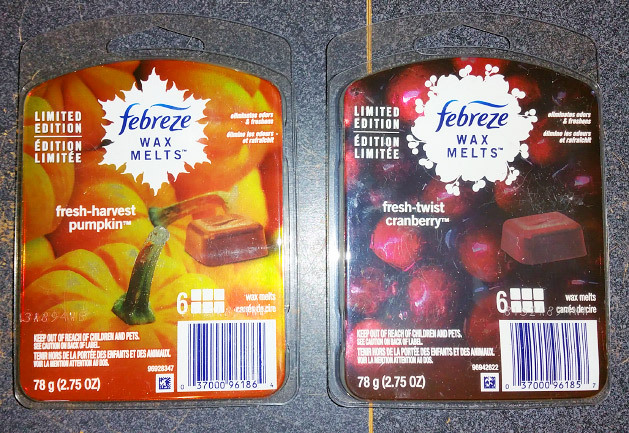 This is a review of two Febreze fall wax melts from 2018: Fresh-Harvest Pumpkin and Fresh-Twist Cranberry. Febreze also had an apple and a pine scent, which are both dupes of older Febreze scents (although the pumpkin and cranberry scents are dupes as well). Notes: Fresh Fall Pumpkin combines creme brulee and pumpkin scents with sweet baking spices. A nice pumpkin spice scent, sweeter than most, with maybe a hint of brown sugar, and not as many spices. But it's a dupe of just about every pumpkin scent they've come out with for years, including last year's Fresh-Fall Pumpkin. This is a dupe of other cranberry scents that Febreze has come out with for years, including Sugared Cranberry and Cranberry Cheer. I think this scent was also out last year. It's fantastic, a combination of fake fruit with just a smidgen of tartness (but not actually cranberry), a hint of a light raw wood note, a little bit of a perfumey note, and a smidgen of a fresh note. It's not a foodie scent and not even all that fruity.